Rutherford B. Hayes was one of the earliest American Presidents with liberal political leanings. He advocated support of public education, prison reform, and reform of the U.S. Civil Service System. He was interested in improving mental hospitals. He also declared for a U.S.-controlled canal across Panama. ■ Rutherford B. Hayes was born October 4, 1822, of Scottish ancestry near Delaware, Ohio. He was the son of a farmer-distiller who died ten weeks before the future 19th U.S. President�s birth. ■ Hayes was educated at a Methodist seminary at Norwalk, Ohio, and at a private school in Connecticut. He studied law and practiced in Cincinnati. He volunteered at the outbreak of the Civil War. He was courageous in combat, wounded five times, and attained the rank of major general. ■ While still in service, Hayes was nominated for Congress in 1864 and elected. He proposed an interesting addition to the 14th Amendment to the Constitution that would require a test for voting qualification. It was defeated. 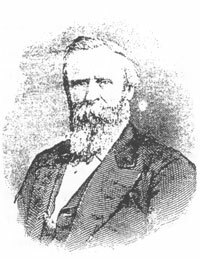 ■ He was elected governor of Ohio in 1867 and re-elected in 1861 and 1875. While governor he pushed through a number of social reforms and founded Ohio State University, all of which gave him a measure of national status. ■ He was nominated for the Presidency by the Republicans and won over Samuel J. Tilden in 1876 in a hotly disputed election. Hayes� administration was noteworthy for its efforts to bring about reconciliation with the South. He also instituted many reforms during his term in office. Pledged to serve only one term, he retired to his home in Ohio in 1881. ■ He suffered a heart attack in Cleveland and died at his home in Fremont, Ohio, on January 17, 1893.